A game that somehow manages to live up to any and all expectations. Every Resident Evil fan needs to buy this game now! I said now! What are you waiting for? It's here, Resident Evil on the iPhone! Yes, really! I know what you're thinking, "it's less than 10 megabytes, how good could it be? Why haven't I heard about it before? It would get too confusing on a small touch screen." All valid points, and yet all of them are wrong. I can say that with such sure-grin because I thought all of the same things. I can't really explain it but CAPCOM managed to somehow capture that same great Resident Evil look and feel that we all love and pack it into a very small package. Now I'm not saying that this is nearly as great of a game as something like RE4 (Resident Evil 4) on the Wii, but it's not meant to be either. This game isn't a compressed port of a previously made game, oh no, it is in fact its very own separate story line built completely and solely for the iPhone. For the die hard RE fans out there you'll recognize that the title of the game is from the animated film that came out (with poor critical acclaim) earlier this year... and at the very least even the most casual zombie killer will be able to recognize the two main characters, Claire Redfield and Leon S. Kennedy from the previous games. 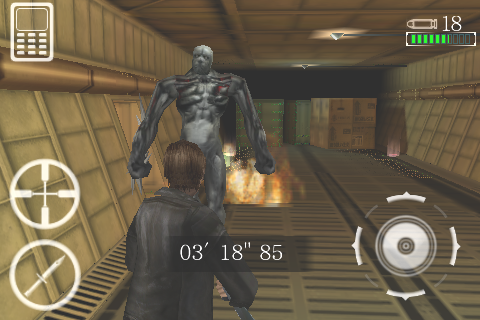 The game is loosely based on the movie itself, both taking place in an airport full of the 'infected', but the movie follows Claire for the most part while the game is entirely from Leon's point of view. If you get a chance to watch the film it will definitely add a little something to the game but is hardly necessary to enjoy it. As Leon you'll end up running from, shaking off, kicking, and of course shooting numerous recognizable enemies including your classic zombies, blood thirsty K9's, Tyrants, and they even managed to work in an area with crows. After all, what Resident Evil game would be complete with out being pecked in the head by a squawking black bird? Unlike the original puzzle based game style from the original RE games that released in the late '90s, this game is designed more in the run 'n gun style and feel of the more recent RE releases. As you run through the maze of hallways and locked doors you will be faced with some challenges and the tasks of tracking down keycards, levers, fuses, etc. to progress into the next area, but nothing that is overly mind numbing. Just as you'd expect, as you progress through the game you'll pick up herbs, first aid sprays, cash, and of course guns... and any guns you don't happen to find along the way you'll simply be able to buy from your local "merchant." The merchants, who apparently are Marines that have rummaged through people's luggage and found items to sell you, are stationed throughout the game for all of your buying needs. These guns do present a bit of a plot hole, after all, who is traveling with a shotgun or uzi packed in their luggage? The game must be based in the Detroit airport (scary!). Regardless, the pistol packing passengers do allow for a more enjoyable game so I won't harp on them too much. The merchants will also buy things you don't want and help upgrade your guns fire power, reload speed, and shell capacity. All of your guns, along with other items, can be viewed, equipped, and used through the in-game menu which also sports a very useful map of each area with open and locked doors clearly marked. This helps immensely in getting through the 12 levels with ease instead of frustration and confusion. Each level ranges in time and difficulty, with the longest taking roughly a half hour and the shortest 36 seconds. In the end, the game said that the total play time for me was close to three hours but this doesn't include the times I died and restarted a level. When all was said and done I'd say it took somewhere between 4 & 5 hours of solid game play to beat it on normal difficulty. Not bad for a game thats only 9.6 MB. My only question is how they packed it all in there? I honestly have no idea, but I would guess that it involves Capcom not wasting time and space on cut scenes. Thats not to say that they don't have them but none of them are live action video, nor do any of them have a whole lot of sound... there is dialogue but all of it is in captions opposed to voices. Alternatively, there is plenty of gloomy music to set the mood of the game and a decent amount of sound effects as well. I must admit, the thing which concerned me most was controls, and thankfully those fears were put to rest fairly quickly. Despite how some of my colleagues feel about virtual joysticks on the iPhone (Chris Hall, the joystick hating bum! ), I think Capcom actually nailed it right on the head in a few ways that I haven't seen in other games. I may spend a more time talking about the controls in this review than some people may care for, so feel free to skip down to the Reusability section below. I'm covering the unique controls in depth for a couple of reasons. 1) some of the things that make the controls great aren't explained anywhere in the game that I've found and I came across accidently. I want everyone to be able to appreciate them like I have. 2) for any developers out there I hope you read this and will consider incorporating some of the concepts into your games. The game is designed as a third person shooter where you're centered over Leon's right shoulder, although if you are using the sniper rifle it will zoom in to a first person point of view with zoom capabilities. The onscreen display shows a radio in the upper left for viewing your map and changing weapons. The upper right corner shows health and ammo statuses. The lower left and right corners are your main controls. One with the virtual joystick and the other with action buttons. Two very nice preferences you can set in the game is whether or not you want an inverted axis or if you want controls mirrored (which reverses which corner the controls are in, I prefer the joystick on the right). By default you will see two action buttons, a crosshairs icon and a knife icon. The knife icon is for up close encounters with zombies while the crosshairs change depending on your situation. As crosshairs it will put you into targeting mode for aiming and shooting dead heads, if you walk over an object it will turn into a "?" icon and you will inspect the object, and if you were near a door then that icon would once again change and you would use it to open the door (tap twice to kick it open). Granted this is a simple concept but it's one I've rarely seen used on the iPhone. I mean come on guys, change the controls based on what immediately suits the players needs, it's not that hard. Next, the joystick. What makes this one different from the rest? The difference is that RE adds some extra gestures for additional actions/movement controls. For example if you are walking and very quickly flick downwards on the joystick Leon will do a quick 180° turn, its incredibly useful if enemies get behind you or if you have to turn and run. When you're in targeting mode your joystick input changes from the direction that you are walking to letting you aim up/down/left/right. But again, by doing a quick flick on the joystick in any direction it will take Leon a couple of steps forward/backwards/or side to side. These gestures add a whole extra dimension to the joystick and gives the whole game a less clumsy feel. Aiming in the game is very important too. At first it appears that looking left to right in target mode is far too slow, but in fact its near perfect. The designers added what I'm going to call aided aiming. It's not quite an auto lock in the sense where it jumps from enemy to enemy, you have to guide the laser towards the desired target and it will slowly (mere seconds) lock on to the 'sweet spots' to shoot target, i.e. on zombies it'd be their heads or legs. This adds more realism to the game as if Leon really has to concentrate to get a perfect shot, just as a real person would. Two other very iPhone-like controls added are the abilities to reload by flicking the phone forwards and if zombies do get a hold of you then you can shake them off by shaking the phone itself. One concern many people have with a game like this is that once you beat it, will you want to play it ever again? In this case I would say probably yes. There are 3 different difficulties you can play the game on... in fact I'm probably going to start on hard right after I finish this review. There is also an unlockable mercenary mode once you beat the game. It's kind of a mini game section where you can play a couple of different levels on a time limit with the goal of killing as many zombies as possible for points. This section, at the very least, will keep you coming back from time to time just to blow up so zombie heads. Blowing up zombie heads... hmmm. This brings me to my only one real complaint about the game, and it may be an immature one, but there just isn't enough blood! In fact there's no blood at all, and it pains me to the core. Now maybe they were trying to target it towards a younger audience, or maybe Apple wouldn't allow something with blood into the App Store (something that will hopefully change with 3.0)... I don't really know, but I do know that one of my most favorite parts of RE games has always been the sound and the feeling you get when you shoot a magnum into the head of a zombie and get to watch it's head explode. Barbaric, I know, but amazing none the less. 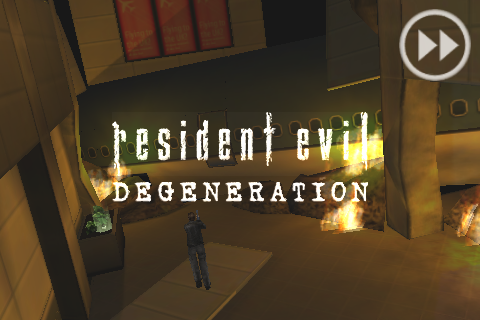 I'm hopeful for a blood update in the future, but in the meantime, Resident Evil: Degeneration will do just fine.